Barb Baird of Bridgeville sits with an IV in her arm for her 4th of 5 treatments of Lemtrada, a new drug used for patients with multiple sclerosis at Allegheny General Hospital on the North Side. Diagnosed about 27 years ago with multiple sclerosis, Barb Baird said she has tried “every drug on the market” but still experiences periodic flare-ups that aggravate her dizziness and balance problems. When her doctor suggested Lemtrada, which last fall received federal approval for treating especially difficult cases of MS, the Bridgeville resident quickly agreed. 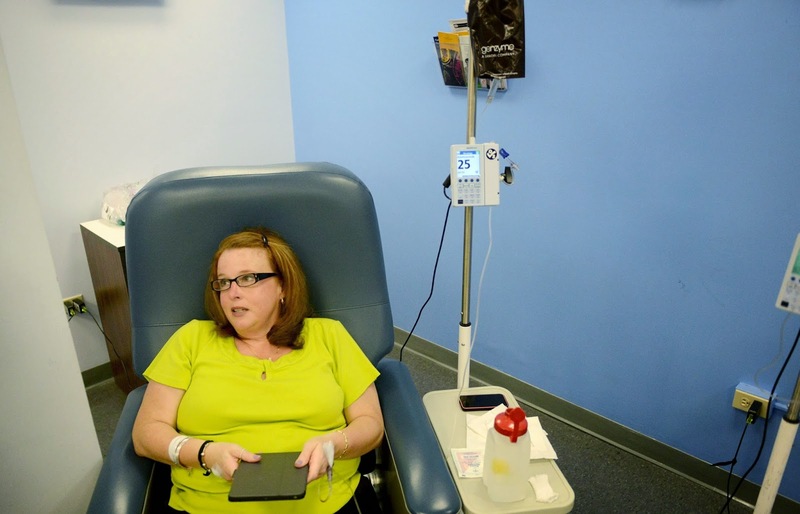 Last week, she became the third MS patient of Allegheny Health Network to take the medication, administered in five intravenous infusions, each hours long, over five days. “This is a last resort kind of thing,” said the cheerful Ms. Baird, 50. Her neurologist, Thomas Scott, didn’t use those words. But he said Lemtrada, which has the potential for significant side effects, including infections and autoimmune disorders, is intended for a minority of patients who have aggressive cases of MS and haven’t been helped by other medications. “Certainly, we think the drug is safe enough to justify its use in patients with more aggressive disease,” said Dr. Scott, director of the Allegheny Multiple Sclerosis Treatment Center and professor of neurology at the Allegheny Campus of Philadelphia-based Drexel University College of Medicine. He said he anticipates using Lemtrada to treat 10 to 20 of the center’s 1,000 patients. Two others received the medication two weeks ago. UPMC has not yet used Lemtrada but likely will do so at some point, said Rock Heyman, a neurologist who is director of the Pittsburgh Institute for Multiple Sclerosis Care and Research at UPMC and a member of the National Multiple Sclerosis Society’s National Medical Advisory Committee. “It’s good to have another option, another tool,” Dr. Heyman said. But at present, the UPMC center has no patients whose conditions require use of a “potent” medication with long-term health risks more severe than those of most other MS drugs. Genzyme, the Massachusetts company that sells Lemtrada, declined to say how many U.S. patients have used the medication since the Food and Drug Administration in November approved the drug for MS. However, company spokeswoman Erin Pascal said it’s being used in major cities around the nation and also has been approved by about 40 other countries. About 400,000 Americans are estimated to have MS, in which the immune system attacks the central nervous system. Symptoms vary from person to person but can include disabling levels of fatigue, weakness, tingling, cognitive deterioration, mobility impairment, vision loss and paralysis, according to the society. Dr. Scott said Lemtrada kills white blood cells that attack the nervous system. He said it’s also hoped that the medication will render less harmful the new white blood cells that form later. Patients receive five infusions the first year and three the second year. Some patients in the third and fourth years of clinical trials have needed no infusions beyond those in the second year. However, Lemtrada’s modification of the immune system has been associated with an increased risk of infections and serious diseases involving the thyroid, kidneys and platelets, said Dr. Heyman and Bruce Cohen, chairman of the society’s medical advisory committee and professor in the Davee Department of Neurology and Clinical Neurosciences at Northwestern University’s Feinberg School of Medicine. According to the society, the FDA recommends four years of blood and metabolic screening after a patient’s last infusion of Lemtrada. Some patients have a steadily progressing type of MS, but most, including Ms. Baird, have a “relapsing-remitting” type, characterized by flareups and recovery periods. In all, doctors have 12 medications for treating relapsing-remitting MS. Each has its niche, said Dr. Scott, who has about 200 patients taking the first oral medication, Gilenya, which made headlines when it was introduced in 2010. Ms. Baird said she has up to three flare-ups a year. Each brings a deterioration in her neurological function, but she doesn’t gain everything back during the recovery periods. Dr. Cohen said such “incremental damage” is common. Ms. Baird once used a cane but now has to use a walker to get around. She’s also experienced vision and other problems. She cut short her career as a social worker, though she continues to do social work on a volunteer basis. While other drugs have helped for a while, all eventually stopped working, she said. “I don’t want to be a grandmother who can’t hold babies,” said Ms. Baird, who hopes Lemtrada will prevent further declines and restore some of her lost function. Lemtrada’s primary purpose is to prevent flare-ups, said Jeffrey Cohen, a neurologist and director of the Mellen Center for Multiple Sclerosis at Cleveland Clinic, who was involved in two major studies that paved the way for FDA approval of the drug.